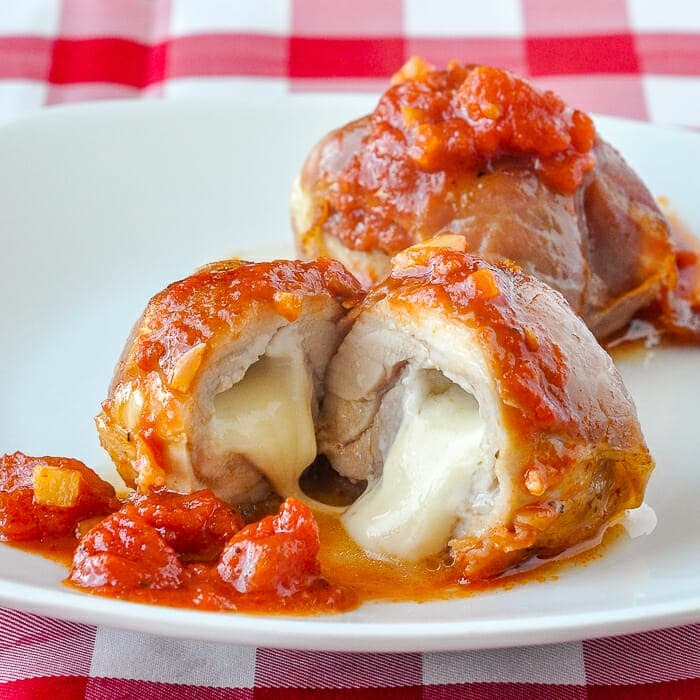 Stuffed Chicken Thighs with Mozzarella Prosciutto & Quick Tomato Sauce. Easy enough for a delicious family dinner but fancy enough to serve at your next dinner party too. 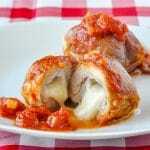 Rock Recipes is pleased to partner with Chicken Farmers of Canada, who provided both compensation and expenses for this recipe post. Opinions expressed remain entirely my own. Chicken is the go-to ingredient for delicious, versatile meals in Canadian family kitchens. No other dinner choice can mean so many possibilities; from tasty tacos to a comfort food family roast chicken dinner. Your family is probably much like mine when it comes to the number of healthy and delicious ways to serve chicken. You love trying new recipes designed to get the family clamouring to the dinner table in eager anticipation. That’s why there are 240 chicken recipes to date on this website and counting! But where does all that chicken come from and how is it raised? When The Chicken Farmers of Canada invited me to visit a family farm in southern Ontario and find out for myself, I was very happy to accept. 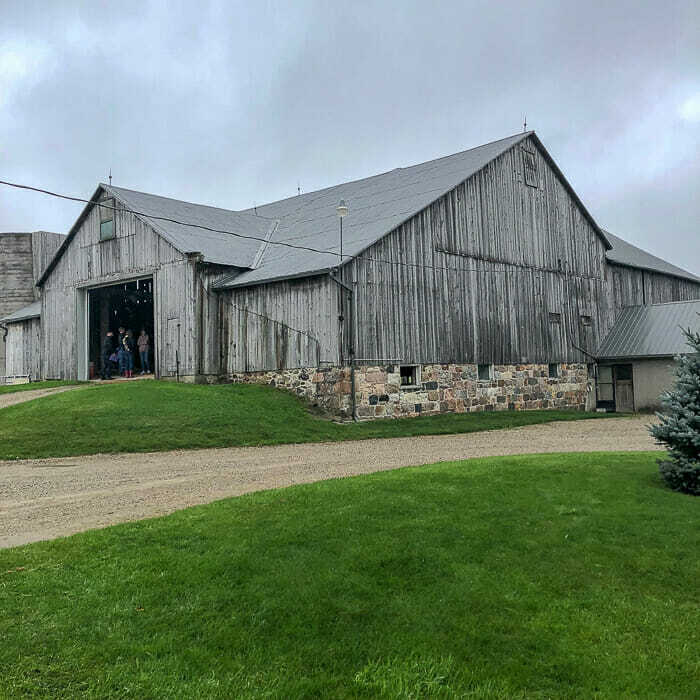 We drove through the beautiful southern Ontario countryside to Perth County, and arrived at the most beautifully stored farmhouse, where we were joined by the farm family for lunch. Their passion for what they do was very evident in the way that they spoke about a typical day on the farm. These farmers really do always keep in mind that they are producing chicken for Canadian families just like their own. Because of this, they hold their work to the highest standard. What impressed, and frankly amazed me, was the efficiency of the technology used in these farms today. Everything is centrally controlled by a computer system to ensure the optimal environment for the chickens to live. Air quality and temperature, plus the natural, nutritious feed and water are all regulated by automated systems and if the slightest thing goes wrong, the farmer gets an alert on her cell phone to respond. 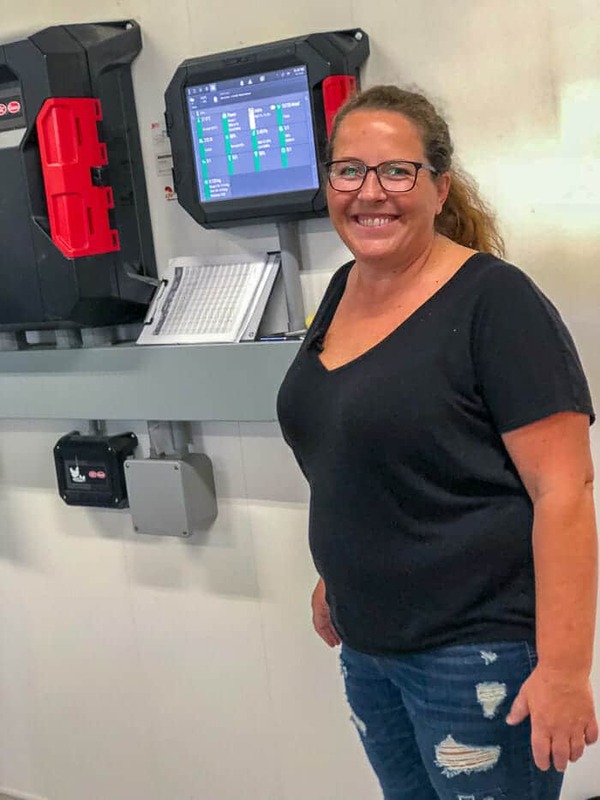 Because of all this automation, just this farmer and her son do all of the day to day work of the farm. I was amazed that they raise 17,000 chickens at a time with only two people! 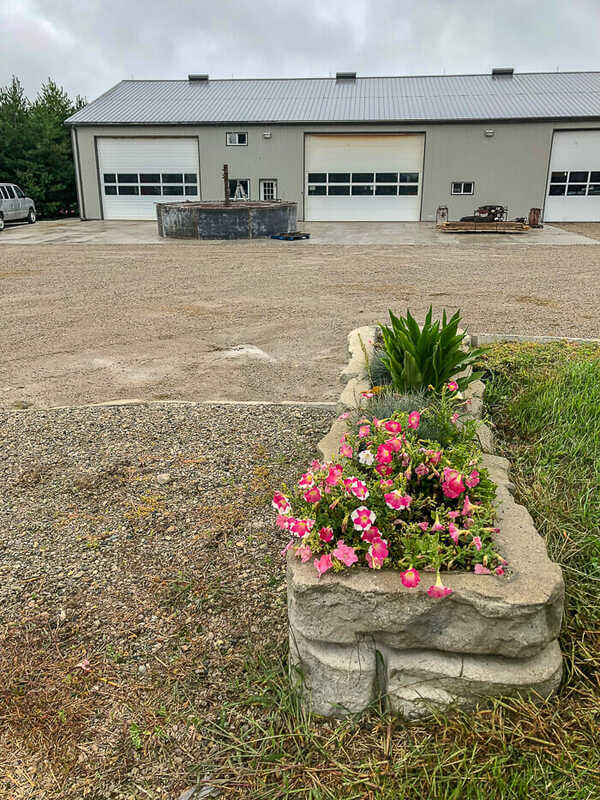 This farmer has invested significantly in this new farm but her son plans on taking it over eventually, so the investment is in a family farm legacy as well. In fact, it may surprise you to know that 90% of chicken raised in Canada, is done so on family farms just like this one. One of the control panels that runs the barn environment to precise standards. 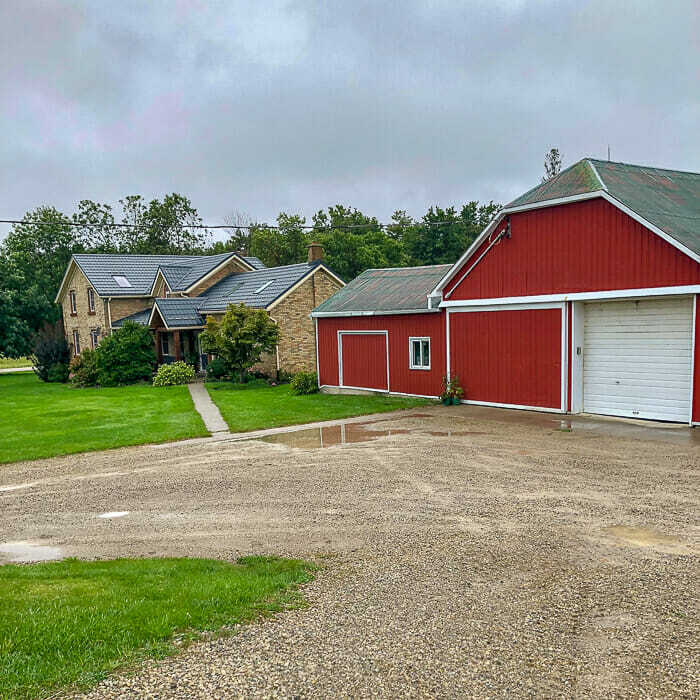 The barn was very clean and spacious with plenty of room for the birds to move around. 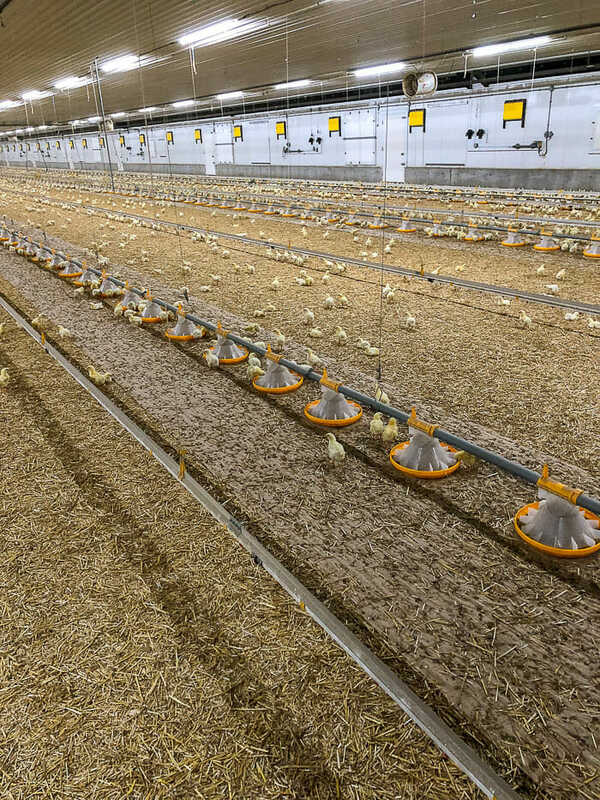 The farm, like 100% of Canadian chicken farms, follows the Canadian Chicken Farmers Animal Care Program which sets high standard for all areas of animal care. In addition the farms follow a very strict biosecurity protocol to ensure the health of the animals. Even on our visit to the farm, we had to don protective clothing and footwear to enter the barn, preventing the carrying of outside infection sources to the farm. Chickens almost 2 weeks old. One thing that I’d learned previously was also underlined by the farmer that day. Steroids and hormones are NOT used in chicken production in Canada and have been banned for decades. These chickens are raised only using a natural, nutritious, balanced feed. It was a terrific day on the farm, where I learned a lot about the science and technology behind modern day chicken farming in Canada. It was wonderful to meet a friendly farm family, committed to producing the highest quality chicken for Canadian families. For more information on this topic, please visit ChickenFarmers.ca . And now, a new recipe to put some of that delicious chicken to good use! These stuffed chicken thighs is the kind of recipe I love because of it’s simple ingredients, ease of preparation and versatility. It’s a recipe you can use as a weekday family dinner or even at a dinner party to impress family and friends. I have found chicken thighs to be a very underused cut of chicken, especially when you compare them to boneless skinless chicken breasts. I am at a loss to suggest why. In the right recipe they are more flavourful and less dry than chicken breasts and deserve to be used more. Properly trimmed boneless skinless thighs can be almost as lean as chicken breast too. Try them in this delicious recipe and you’ll be a chicken thigh convert too! 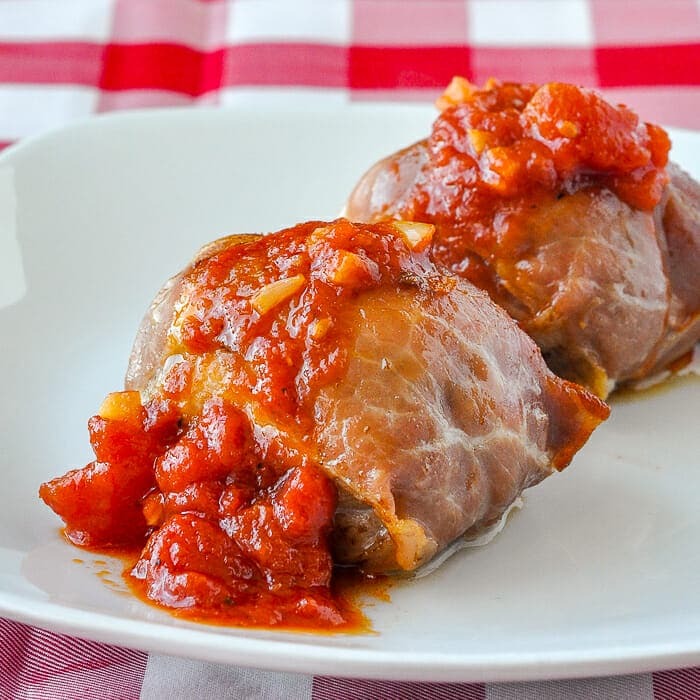 We serve these with any pasta we have on hand, with plain steamed rice, or even smaller, nugget versions of our English Style Roasted Potatoes, which are delicious with the quick, delicious tomato sauce. Like this Stuffed Chicken Thighs recipe? Prepare the Spicy Tomato Compote first. In a large sauté pan, sauté the garlic in the oil over medium heat for just a minute until the garlic softens but does not brown. Add the tomatoes, brown sugar, chili sauce, salt, pepper. Continue to cook until the tomatoes soften and the compote reduces to a jam-like consistency. Add the balsamic vinegar in the final minute or two of cooking before serving. Keep warm until ready to serve over the chicken thighs with freshly cooked pasta, rice or even roasted potato nuggets! To prepare the chicken thighs. Debone and skin the chicken thighs and trim of all visible fat. Lay the trimmed chicken thighs on a cutting board and season lightly with salt and pepper. Season only thins side. The prosciutto will season the outside of th chicken thighs, so be careful to add only a little salt. 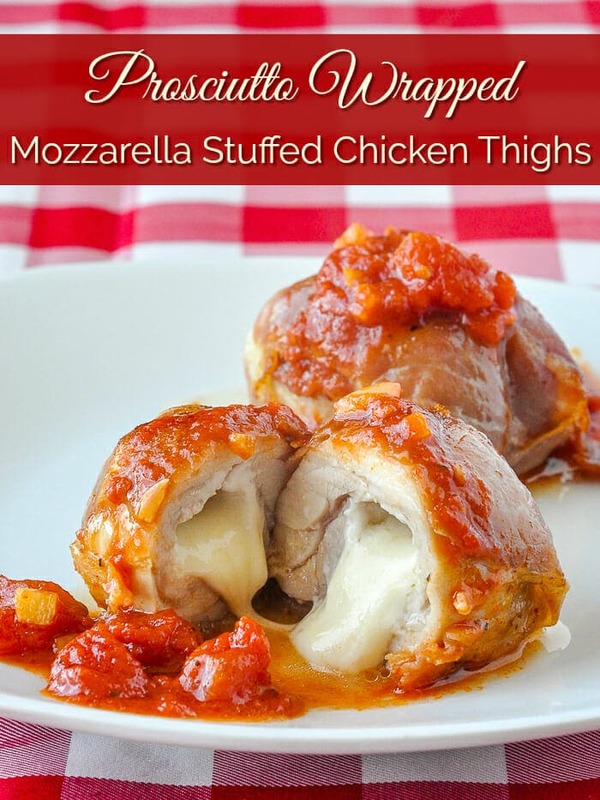 Add a 1 ounce block of fresh mozzarella cheese to the centre of each chicken thigh. Fold the chicken meat around the cheese to cover it. Wrap each chicken thigh completely in the thinly sliced prosciutto, then place on a parchment paper lined baking sheet, keeping them separated by about 2 inches. You can keep the prosciutto tightly wrapped to the chicken by using a couple of toothpicks during the roasting tome if you like, but use the same number of toothpicks in each, so that it's easy to remember to remove them all before serving. Bake at 375 degrees F for about 45-55 minutes depending on the size of the thighs you are using. To be certain, use a meat thermometer to make sure the centres af the cooked pieces have hit 170 degrees F. Over baking these can cause the cheese to ooze out onto the pan. Serve over pasta or rice with a sprinkle of the grated Parmesan cheese. Hi. I like the looks of this recipe, although I haven’t made it yet. I have a question. Have you tried freezing these? If so, at what stage would youfreeze them, cooked orcraw, and how would you cook them? From frozen? I have not frozen them but if I did it would be raw and I would thaw them before cooking. Regards, Barry. These were delicious. I didn’t put that much cheese inside, which made no difference in taste and cut the fat and sodium down. I put the prosciutto on the outside of some of the, too – I did not salt anything since the meat and cheese have enough salt on them. For the tomatoes, I used some that already had spice in the can, so I didn’t have to add anymore. I froze some for another meal, and can’t wait to use them! OK We eat a lot of chicken in our household. So much so my wife has gotten pretty tired of it. That being said, I had gotten into a rut with my chicken preparation, also. I saw this recipe and and said Hmmm I like chicken. I like tomato sauce. I love cheese and I like the idea of prosciutto. My wife and I loved this dish. These look SO delicious, Barry! Tomatoes, mozzarella, and prosciutto are a divine combination!